It confirms a lot of the hints and speculation in various threads about the board. Back and Hamstring locations should be included in armor locations unless they are cut (which I hope isn't the case). Writing the shield statistics into the Melee weap boxes is still messy. I'm never going to fit "FTN6, Arm+2, Spiked, Emarmed" into the notes box and the 2 DR ratings and reach boxes are irrelevant. Maybe just drop 2 rows off the bottom of Melee and add in 2 lines for Shields with FTN, DR, Favoring and Notes? Who needs 6 non shield melee weapons at once? I might suggest rearranging some stuff on the second page, as well as swapping some columns around. Not important, just my OCD preferences. See below. Agamemnon wrote: For those of you who game online, we're pleased to announce that Barbarossa has already gotten a preliminary Roll20 version of the sheet set up. When the game makes its official debut, we'll submit the code to Roll20 so that it can be made publicly available. As time allows, we'll also be releasing a form-fillable version of the pdf, so no matter how you're gaming, we'll have you covered. You mean the basic dice is now a D6 instead of a D10? Sincerely hope not... it would spell a huge no for me even before reading the system. In any case, from what I've gathered, this hints at a tone-down in granularity which personally would not impress me at all. The hobby is already full of such systems. Here is to hoping I've got it wrong. thorgarth wrote: You mean the basic dice is now a D6 instead of a D10? Sincerely hope not... it would spell a huge no for me even before reading the system. Why would it be a huge no? The size of the dice makes very little difference in a dice pool system. That would only be true If the system was completely static in terms of Target Number, where modifiers only ever are applied to the dice pool totals. The granularity just ain't the same (hence why I prefer %systems). Brawn Tap Value, aka the modifier of damage and wounds. The rest of it, noted! thorgarth wrote: The granularity just ain't the same (hence why I prefer %systems). It is exactly just one point worth of difference -- successes being 3456 vs 67890. And in the d10 using draft, one could only reach BTN10 by getting a level 5 wound. Since those often mean death, dismemberment or similar, that last +1TN was quite literally adding insult to injury. So, not strictly necessary. All in all, it changes surprisingly little. Guess we have to wait for this new draft to be released... hint! Neat and slim layout. It's a promise to all those that hope SaS will become the first TRoS daughter with really free flowing combats. I think we're heading in the right direction! We had trades before, we still basically have them now. The only new bits in that regard are the inclusion of mercantile and stewardship. Mercantile is definitely an economics skill. Stewardship is household and resource management. I'm actually glad that they were included, as the very first Scoundrel-era playtest, Barbarossa decided he wanted to make a criminal accountant. It worked out perfectly. Not pictured: Expertise, Lore, Navigation, Perform, Survival, Trade -- any skill that has to be (Specific). That's what all the blanks are for. 1. This is part of a broader restructuring of how we're presenting the combat system in the game rather than actual rules changes. Before it was assumed that the most complicated iteration of combat was the default, but that it could be scaled back down if you wanted something simpler. We decided that for the sake of new players and teaching new players, that we were doing it backwards. In the book as it's being written now, it assumes that the default combat system is essentially the equivalent of the "basic maneuvers only" option from the previous build. This setup doesn't need emphases or even proficiency-specific maneuver lists, so we can cut all the maneuvers stuff from the proficiencies chapter entirely and park them after the chapter on melee, bringing those two back together for ease of reference. All of the advanced stuff will get parked immediately afterward and be presented as an optional level of complication for people who are interested in that. From an end-user perspective, if you were using the full rules before, nothing will change for you. You'll still have the same level of detail to play with. This just makes it easier for new players to pick it up and understand it. 2. Emphases are currently under construction.We have some ideas set up and built on, but we're trying to make sure all of the combat stuff (new maneuvers and such, along with the other tweaks) is rock solid before we add another layer of variables with Emphasis. 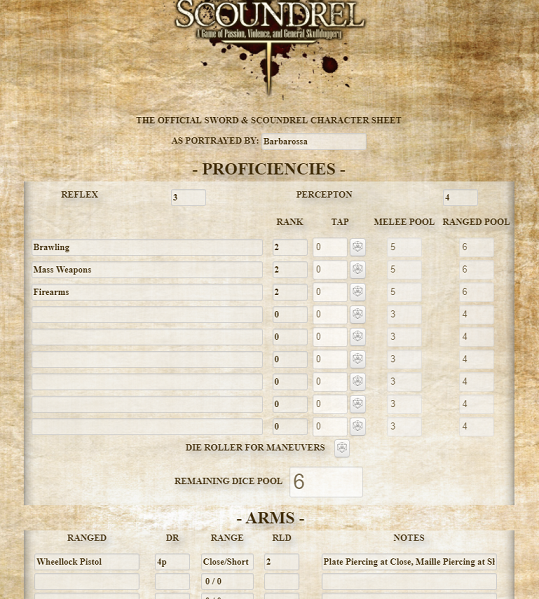 Later, I want to do an expanded character sheet that will give a lot more room/instructions for things and break things down into more specific bits for people who want to be able to record their character information and abilities in more detail. I did enjoy that the dots became a decorative element on their own. It looks pretty neat when you get it filled in, as well. Weapons didn't have a CP penalty in the previous write-up. Amusingly, they actually do now in a roundabout way. Insignificant: Anything that is part of normal clothing, or an fit easily in a pocket or small purse. A worn doublet or pair shoes, jewelry, a coin purse, a piece of chalk, flint and steel. It counts as 0 bulk. You can also have 3 items readied at any given time (i.e. drawn in combat or otherwise quickly accessed without having to fumble through a pack.) These represent belted weapons and such. You can ready up to 3 additional weapons (total six) for +1 bulk. Total your bulk. If it's higher than your Brawn, the difference becomes Encumbrance. This is both an increased req on physical tasks and a CP penalty in combat. thirtythr33 wrote: Back and Hamstring locations should be included in armor locations unless they are cut (which I hope isn't the case). We've technically never really tracked armor for these locations. It was generally assumed that if you have the front piece, you have the accompanying back-piece. Otherwise, our armor system needs to become even more granular and we have to make purchasing armor that much more complex. I'll have to think on that for a bit. thirtythr33 wrote: Writing the shield statistics into the Melee weap boxes is still messy. I'm never going to fit "FTN6, Arm+2, Spiked, Emarmed" into the notes box and the 2 DR ratings and reach boxes are irrelevant. Maybe just drop 2 rows off the bottom of Melee and add in 2 lines for Shields with FTN, DR, Favoring and Notes? Who needs 6 non shield melee weapons at once? While you probably wouldn't need them all at once I wouldn't much care for erasing and re-writing constantly if I had more than one set of stuff I routinely carried. Dropping two lines off the bottom would leave you with three slots. A 16th century character could max that out easily just by going musketeer - rapier, pistol, main gouche. If he also had a boot knife, he's already out of room, to say nothing of a musket and/or bayonet. I'll look into adjustments we could make, though. thorgarth wrote: That would only be true If the system was completely static in terms of Target Number, where modifiers only ever are applied to the dice pool totals. The granularity just ain't the same (hence why I prefer %systems). We work a bit differently than other tros-like games. In practice, the primary role of the TN is tracking wounds/fatigue/etc penalties. The extent to which it is modified outside of that is either an advantage (-1TN) or a disadvantage (+1TN). In either case, less granularity is actually better because it makes that +/-1TN more impactful. EinBein wrote: Neat and slim layout. It's a promise to all those that hope SaS will become the first TRoS daughter with really free flowing combats. I think we're heading in the right direction! I've been pretty happy with my playtesting of this setup so far. we're a half-dozen sessions in and it's been very smooth sailing. Exactly the reason why I prefer higher granularity. It allows for a finer level of detail in the application of modifications. +-5% ain´t the same as +-10% or 20%. +-1 in 1d6 it´s just too rough for my taste. Way too rough. I will give the benefit of the doubt till I read the draft but I fear for it. I'll let everyone know if I get that working. "Scratch a conservative and you find someone who prefers the past over any future. Scratch a liberal and find a closet aristocrat. It’s true! Liberal governments always develop into aristocracies." Agamemnon wrote: The only new bits in that regard are the inclusion of mercantile and stewardship. Mercantile is definitely an economics skill. Stewardship is household and resource management. Gambling is also new and money making oriented. It is also arguable that Negotiation could be used increase wealth. Agamemnon wrote: The problem with a location-based armor system is that you inevitably wind up having to record all those locations. Our previous sheet tried to make this easier by just letting you pencil in the broad strokes so you didn't have to fill in 26 boxes. Well, you only need to fill out all 26 if you are wearing metal armor from head to toe. If you just record BTV+AR in 1 column and the armor properties (M and/or R) in the 2nd column you don't need to fill in any unarmored locations or properties for gambeson. Agamemnon wrote: We've technically never really tracked armor for these locations. It was generally assumed that if you have the front piece, you have the accompanying back-piece. Otherwise, our armor system needs to become even more granular and we have to make purchasing armor that much more complex. I'll have to think on that for a bit. I always thought they were tracked. You have separate listing for breast and back plates in the dueling kit and separate hit locations in the wound charts. Even if you assume breast and backplate are always together, hamstring is definitely not always the same as shin. You can wear nothing, gambeson or chausses under your plate leggings. 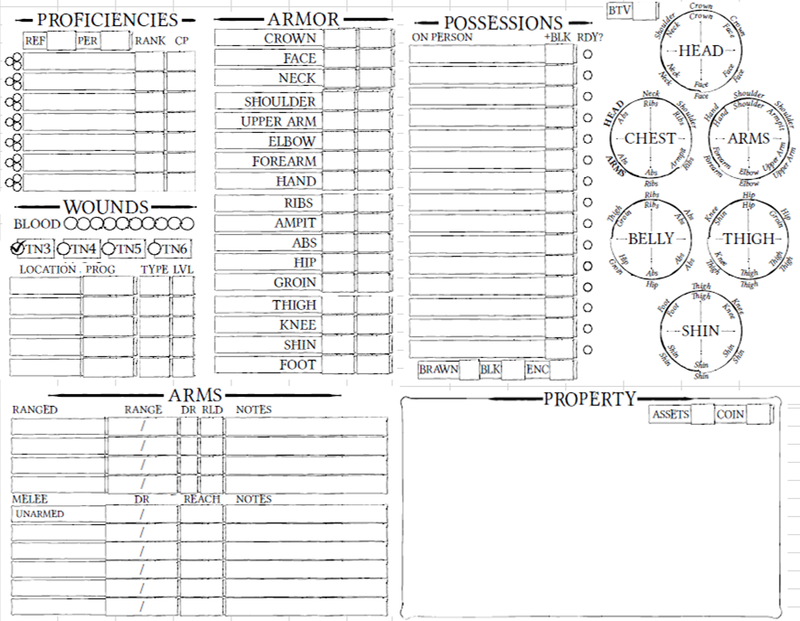 But I don't see how it is any more complicated than just adding the 2 locations to the character sheet and listing them as covered items in the relevant equipment entries. Agamemnon wrote: Dropping two lines off the bottom would leave you with three slots. A 16th century character could max that out easily just by going musketeer - rapier, pistol, main gouche. If he also had a boot knife, he's already out of room, to say nothing of a musket and/or bayonet. I'll look into adjustments we could make, though. Then what about dropping some of the ranged ones? Most ranged weapons are 2 handed, so you can't really have more than 1 at a time. Rifle/Bow/Crossbow plus a backup pistol and knife that can be thrown is max of 3 ranged slots. Agamemnon wrote: You can also have 3 items readied at any given time (i.e. drawn in combat or otherwise quickly accessed without having to fumble through a pack.) These represent belted weapons and such. So no more positioning rolls required to draw a weapon from a scabbard? Agamemnon wrote: Total your bulk. If it's higher than your Brawn, the difference becomes Encumbrance. This is both an increased req on physical tasks and a CP penalty in combat. It seems silly to me that the Brawny fighter in plate could have a lower penalty to sneaking than the Agile rogue in maille. Setting penalties above a threshold instead of immediately also means you never have a reason to strip down to lighter gear if you aren't already over your Brawn. It might be neat if picking up or dragging another character treats them as being Enc equal to their Brawn (half for dragging). Then you basically rely on the increased Req on the movement rolls to slow them in the skirmish. Plus then you can just use Enc in the feats of strength tables instead of pounds. Gambling, kinda sorta. I get where you're going with it. I tend to look at it as a social skill more than anything, as that tends to be where it comes up. Negotiation isn't any more directly tied to finances any more than any of the other social skills are. If you're going to haggle with someone to reduce the cost of an item, you could go in and negotiate a better deal.. or you could just as easily try to seduce them (manipulate), make a flowery appeal to their patriotism and thus a discount for the greater good (oration), or hint that if they don't lower their prices, some customer might take it personally and burn the joint down (coercion). The only skills that in any way plug directly into the wealth rules are Mercantile and Stewardship. Being readied represents the thing in a scabbard and available to be drawn in combat (via said roll). We had this in the previous system as well, just arranged slightly differently. Those were the "crucial" items on the sheet. It seems silly to me that the Brawny fighter in plate could have a lower penalty to sneaking than the Agile rogue in maille. Two totally different issues. Someone who is in better physical shape is going to be able to bear a load better than someone who is less strong. The easiest way to represent that mathematically is in a penalty based on encumbrance. Your counter-example is broken for a number of reasons. If you assume the brawny fighter doesn't have a stealth skill, then the example is wrong regardless unless your rogue has the minimum possible Brawn of 2 or the brawny fighter has a brawn of at least 5 AND an agility of 7+ (in which case, why isn't he the "Agile" fighter?). But the bigger issue with stealth in particular is that both armors are noisy, which has nothing at all to do with encumbrance. If we are going to worry about that, then that's an entirely different set of modifiers. For most tasks where this comes up, you're probably rolling either raw Brawn or Speed, in which case it makes fine sense to me that the person who carrying less relative to their carrying capacity is going to perform better, all other things being equal. thirtythr33 wrote: Setting penalties above a threshold instead of immediately also means you never have a reason to strip down to lighter gear if you aren't already over your Brawn. Plate alone is 5 bulk. Add a sword and a dagger to that and you're already at 7. (Clever observers might work out that this would be the average fit person -- Brawn 4 -- at a 3CP penalty, identical to what it was before the change) Unless your character is specifically brawn-focused, you're taking penalties. Even then, though, encumbrance isn't the only detriment to carrying junk. In-character, most of the time you can't get away with carrying full kit everywhere you go unless you are in very specific situations. You certainly can't rest in it, people will look at you funny for it, and if players absolutely insist on carrying a giant santa sack with them everywhere they are, call them out on it. Have NPCs bug them about it. Have someone try to steal their bag. There's more stuff going on in play than just "needs more mechanical penalties." Integers weren't really "Working" before. You just rounded down to whole-numbers regardless. Because of the abstract wealth system, it's a little less "buy each piece separately" but you can still mix-and-match. thirtythr33 wrote: It might be neat if picking up or dragging another character treats them as being Enc equal to their Brawn (half for dragging). Then you basically rely on the increased Req on the movement rolls to slow them in the skirmish. Plus then you can just use Enc in the feats of strength tables instead of pounds. We're doing something akin to that already in the encumbrance section. The feat of Strength table as it used to exist isn't really a thing now. Do you guys have any schedule/date for the release of the next draft? Having an item readied allows accessing it via Stunt maneuver during combat (just like one could formerly access crucial items via positioning). If an item is not readied, you can't access it during melee at all. thorgarth wrote: Do you guys have any schedule/date for the release of the next draft? In all seriousness though, I just submitted my edits. Wasn't nearly as red as the last time. Either I missed a bunch of stuff, or Agamemnon has acquired a spell checker.